these pictures make it all appear rather busy, but in reality it all flows really well. for a long time now i've needed somewhere to store and display all of my many floral crowns, and after seeing a few girls on instagram displaying theirs in a tiered stand, i decided to join the bandwagon. i found this beautifully ornate cream stand on the site, and knew it was going to be perfect. it's the right height, the perfect colour and it's bloody pretty. i love the results! something else that's been missing from my dressing table area is a good mirror. i have a built-in mirror on my make up table/other dressing table (yes, i have two areas; one dedicated to make up and jewellery, one dedicated to hair stuffs...), but the cord of my hair dryer and straighteners don't stretch to that side of the room, and i am forever guessing how my hair looks, or doing it facing the wall and then popping over to the mirror to check, and then back again. it's rather annoying. 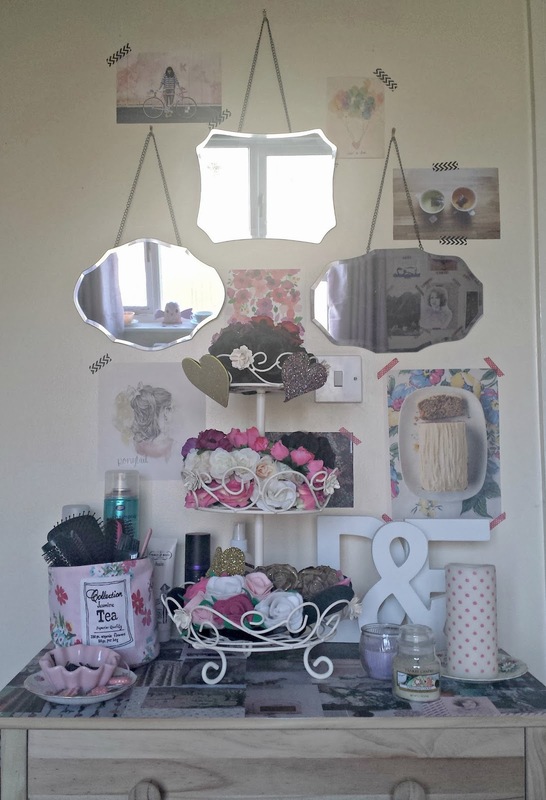 so, this trio of vintage mirrors is the perfect addition to the collage of pictures i have above the dressing table. they're three different shapes, with a real retro feel, and look bloody lovely on the wall. plus, the reflected light opens the room right up too, an added bonus. so, what do you think of the little makeover? Great storage idea, so pretty and practical! Thanks for sharing. I managed to find storage solutions for most of my essentials (read:girly crap) but still having trouble with my hairbands. Current plan is looping them over a bottle of wine and leaning the wine against a wall....perhaps it's time to check out the range?